The main stage of TIF 2017 is located in the Smileland of Odaiba Minnna no YUME-TAIRIKU 2017. It is a dream stage where groups representing the idol world will appear one after another. 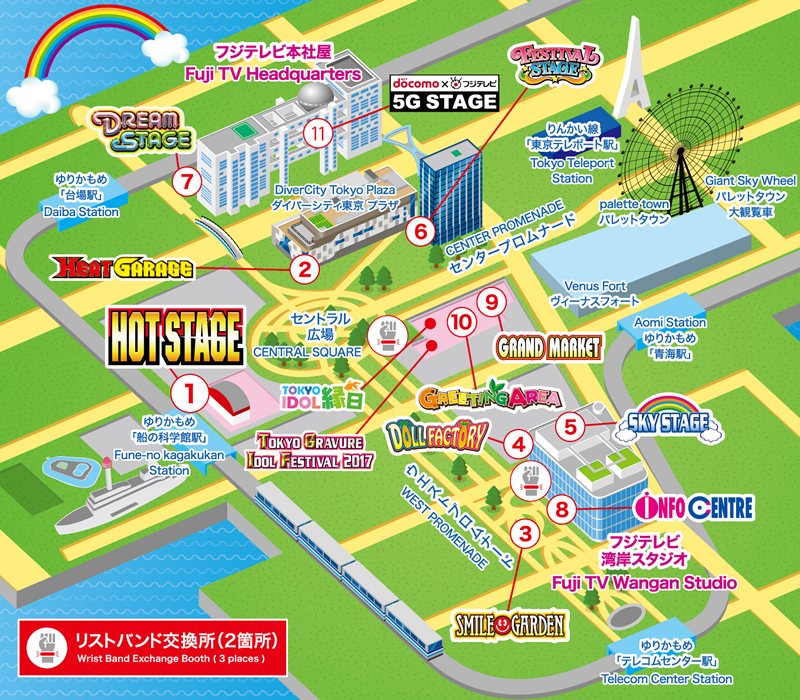 Twinning with the "HOT STAGE", it is the largest stage of TIF 2017. In a hot atmosphere unique to large live houses, premium live performances and events of main-stage level will be delivered to you! Known as "Idol's sacred place" by every idol fan. As the stage symbolizing TIF, it gathered numerous fans and witnessed numerous legends. What kind of performance can be seen this year on the stage? An indoor stage in the Fuji TV Wangan Studio that has produced a lot of stories. On this stage where the cuteness and glamor of idols can be fully perceived, what kind of story will be born this year? Be sure to check it! Located on the rooftop of Fuji Television Wangan Studio, this is TIF's famous outdoor stage with sense of utmost openness. The scenery of Odaiba that changes with time, together with the beauty of idol's performances is a must-see. Adjacent to the DiverCity Tokyo Plaza, it is a free stage where various people come and go. Come and experience the festival of idols in this very "FESTIVAL" place symbolizing TIF! "Odaiba Minnna no YUME-TAIRIKU MYNAVI STAGE” will appear as "DREAM STAGE" during TIF 2017! A number of idols who are expected to make a breakthrough NEXT will appear at the free stage at 1F of Fuji Television Headquarters. It is an indoor stage prepared at multipurpose hall in Wangan Studio. You can get information such as the latest news and secret anecdotes of each idol group, which can only be heard here. A market space selling all idol-related products. It is a dream market where various items such as CDs and other goods can be acquired at once. ※ To ensure the safety of performers and customers, metal detection and baggage inspection, etc., will be carried out at the entrance. The place for handshake meeting with each idol group. It is a spot where you can get in touch with idols at a close distance. It is the filming location for the TV program "Konoyubi To-mare!" that brings out the charm of top idols throughout Japan, and has been selected this year as a new sanctuary for idols as "an idol live stage by Idols and for idol fans"!! >>Rooftop garden on the 7th floor of Fuji Television head office building. The event that excited Odaiba in the summer last year is coming back!! The popular section of Idol Yokocho Summer Festival -- "Gradol Yokocho (abbr. for Gravure idol)" will come back at TIF2017 this year as "TOKYO GRAVURE IDOL FESTIVAL 2017"!! A number of gravure idols active in TV and magazines will appear! Moreover, with live show idols in their one-day-limited swimsuits, it will be an area full of highlights! Of course, there will also be other popular sections that involve customer participation, such as taking instant pictures with idols in swimsuits and water gun shooting battles!! "Tsuribori Yokocho" that gained its familiarity during the Idol Yokocho Summer Festival will be held at TOKYO IDOL FESTIVAL this year as well, as "TOKYO IDOL Ennichi 2017"! Come and enjoy goldfish fishing with idols, and taste the feelings of dating at Ennichi!